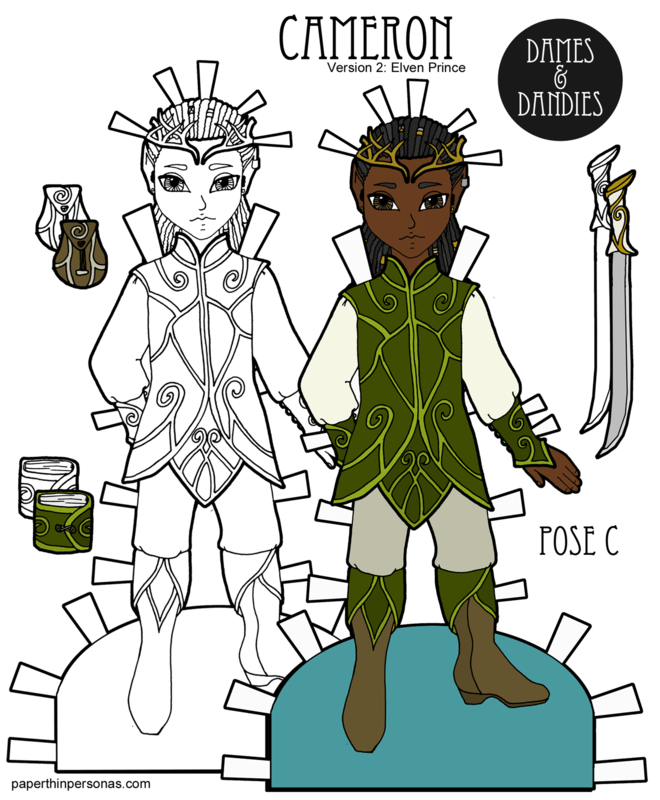 Today’s paper doll is the first C Pose Dandies to get a what I think of as a “Themed” set. It’s Cameron and he’s an elven prince with his crown and everything. I knew from the beginning of the Dames and Dandies series that having a consistent guy paper doll series was important. First off, I get a lot of requests for guy paper dolls from parents and I also know that I’m not the best artist, so I don’t like trying to draw poses to scale of each other if I haven’t started with that goal. Figure drawing and I… Well, I won’t say we’re enemies, but we are not friends. But guy paper dolls were never my favorites as a kid. I struggle even today to sort out what to draw for them, because my ideas tend default to ladies. This is nothing against guy paper dolls, but I’ve been drawing lady paper dolls since I was… like ten? And I’ve been drawing guy paper dolls for… four years? Maybe? Moral of the story, I just like drawing girls more. Anyway, I wanted to do an elven prince and I thought it wold be fun to feature Cameron. There was going to be a Viking version of Cyrus and… I had plans. But the Viking hair/wig I created for Cyrus totally didn’t fit (oops) and so there’s no Viking to go with our elf. So, this won’t be the “week of C Pose” that I had originally planned it to be. But this is the first day of October and that means Inktober has begun! For those of you who are Patrons, this is old news. For those of you who aren’t, Inktober is a project where people (mostly on Instagram) draw pen and ink drawings for the month of October and post them. Some folks do one a day. Some folks do one a week. My goal is ten over the course of October. Follow me on Instagram if you want to see the drawings. And, of course, I always love to hear from you, so leave me a comment and let me know what you think of Cameron, elven prince. love it! It’s amazing you have so many guy series even though you don’t care to draw them as much. This one is probably my favorite, because i love his hair.